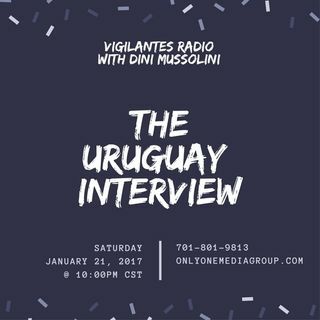 Uruguay stops by to chat with Dini Mussolini about their latest release, "Sabrina Segment" & all things music...the beginning...the journey...the future! Set your reminders, because it's happening! 01/21/2017 | @10PM CST | dial 701-801-9813 | or via the browser by visiting www.onlyonemediagroup.com/vigilantesradio and slapping that "Go Live" button.